Soc'ing Out Loud: Who Are the "Religious But Not Spiritual?" Who Are the "Religious But Not Spiritual?" 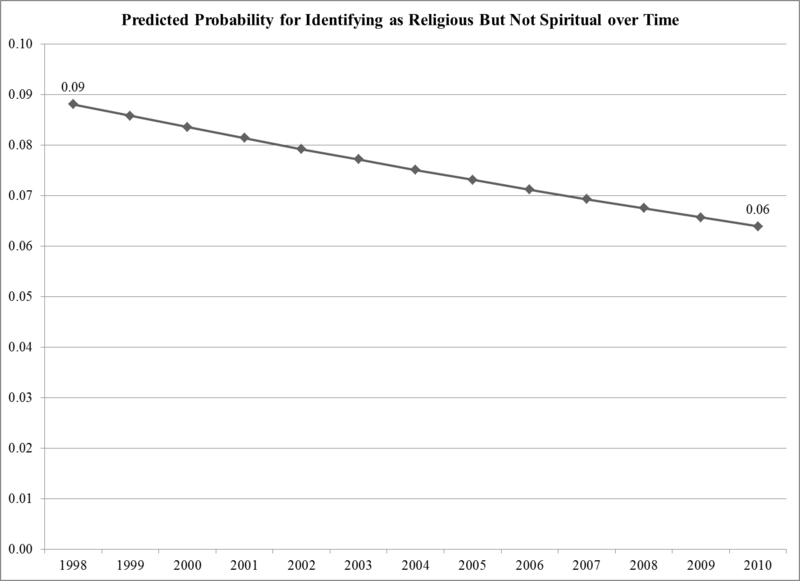 There's been a lot of talk lately about the growth of the religiously unaffiliated and, in particular, of those who claim to be "spiritual but not religious." There's no dearth of scholarship on this area of increasing Sheilaism. I'm interested, though, in the folks who claim to be "religious but not spiritual." Here is just an exploratory look at this group using logit regression of GSS data. I created a dummy variable for those who simultaneously claim to be slightly spiritual or not spiritual (SPRTPRSN) and moderately religious or very religious (RELPERSN). Surprisingly, neither race nor gender are predictive of this identity; education and income, however, do have a significant effect in some models (though, these variables add little information to the predictions): those who have at least a bachelor's degree are less likely to be "religious but not spiritual," and those who have higher levels of income are less likely to be "religious but not spiritual." Year of the survey is relatively predictive, though. While the move is small (only 2 percentage points over 12 years), the variable is significant at the zero-order (p=0.008) and is robust when controls are added. People are increasingly less likely to claim to be "religious but not spiritual," but that these people exist at all is somewhat surprising. I'll be looking more at this in the future.